Essential oils are the aromatic, volatile liquids distilled from plants. The oil can be obtained from the roots, seeds, shrub, flowers, leaves and trees and bring health and healing to the body. The chemistry is extremely complex and may consist of hundreds of different and unique chemical compounds. oils were mankind's first means of wellness and are in fact mentioned ALL throughout Scripture. The oils are very powerful which is why they are able to reach every part of our bodies on a cellular level. Within minutes of using or breathing in an oil, they can be found in every organ in your body! The fragrance of the oils work on the limbic system in the brain where emotions are stored and can help relax and clear the mind as well as release emotional trauma (this emotional stuff is HUGE for our overall wellness!). They can have profound physiological and psychological effects as well! They can reach every cell in your body within 20 minutes when applied topically to the body, eliminate toxins in your body, regenerate DNA, pass the “blood-brain” barrier, work on emotions via the limbic system of your brain when inhaled, release emotional trauma, relax and clear the mind, transport nutrients to starving human cells, act as powerful antioxidants, increase atmospheric oxygen, remove toxins in the air, and increase ozone and negative ions in the area which inhibit bacterial growth. Diffusing essential oils is a perfect way to improve your home, work, or living environment. Diffusing can purify the air and neutralize mildew, cigarette smoke or other odors as well as protect you and your family from harmful things we breathe in the air. Aromatic use can also help with mood regulation. Place 2 drops into the palm of your hand; rub clockwise with the other hand. Cup hands together over the nose and mouth and inhale deeply. Add several drops of an essential oil to a bowl of hot (not boiling) water. Inhale the vapors that rise from the bowl. A towel can be placed over the head and bowl to increase the intensity of the vapors. Apply a few drops of essential oil to a cotton ball, tissue, natural-fiber handkerchief, or clay necklace and inhale periodically. Diffuse in a Young Living Diffuser. Direct application onto the skin is one of the easiest ways to use essential oils. It is also a highly effective method since essential oils can easily pass through the lipid membranes of cell walls. They are able to penetrate cells and disperse throughout the body within minutes. The bottom of the feet is a good place to apply oils directly because many nerve endings are found there and the pores of the skin are large in that area. Before you start, remember to test a small area of the skin first. Apply one oil or blend at a time. The longer essential oils stay in contact with the skin, the more likely they are to be absorbed. To reduce evaporation and enhance penetration, putting socks on after applying can help! Carrier oils extend essential oils when they are applied to a large area, and can decrease skin irritation as well. When applying essential oils to children, always use a carrier oil. Examples of common carrier oils include coconut oil, grapeseed oil, vitamin e oil, sweet almond oil, & olive oil. Make a capsule using empty vegetable capsules. Fill it with carrier oil and swallow! Try a drop or two (start slow!) in your water, NingXia Red, smoothies, cocktails, & other drinks. Use in your cooking in placement of or addition to herbs, spices, or citrus zest. Safety is of utmost importance when using essential oils! It’s easy to get overwhelmed with all of the information out there; but using common sense and starting gradually will help ease any sort of intimidation you might feel as you begin using essential oils in your everyday life. We recommend grabbing yourself a reference guide of some kind. 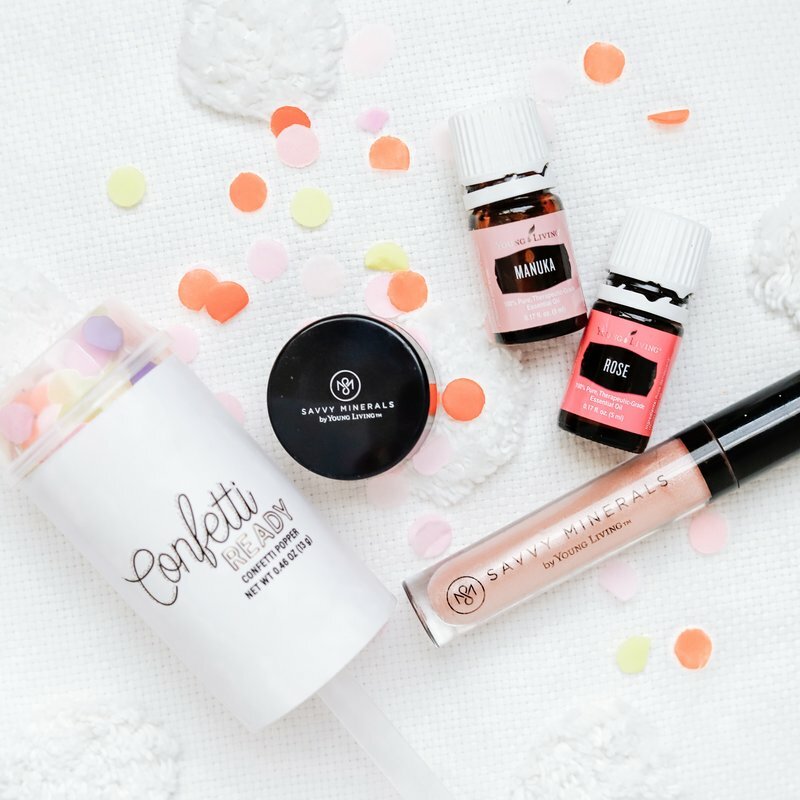 Our favorites are found here in our oily swag favorites. Young Living oils' purity + grade are very high (which is why we love them! ), so they should be used with knowledge!. We also only recommend using Young Living Oils and do not recommend using any other brand. It’s important to keep oils in a cool, dark place with lids tightly closed. Always use and store oils in glass containers, especially when drinking them in water, since most plastic products contain chemicals that can be easily broken down by the oil. Most oils are generally safe for use during pregnancy, but need to be used with common sense. A great resource is the book Gentle Babies. Citrus oils are photosensitive when applied to the skin. Most undiluted photosensitive oils require 12 hours before sun exposure but some can take up to 48 hours. So it's best to use them in your nightly routine! Keep oils away from eyes and never put them directly into the ears. Should irritation or accidental contact with eyes occur, never use water to clear the oil (they are not water-soluble). Instead, use a carrier oil (such as coconut oil or jojoba oil) to cleanse the area &reduce discomfort. 01. ESSENTIAL OILS CAN BYPASS DIGESTION. 02. ESSENTIAL OILS ARE FAT SOLUBLE. THIS MAKES THEM ABLE TO EASILY ABSORB INTO THE SKIN. WITHIN A FEW MINUTES OF PUTTING AN OIL ON YOUR SKIN, THERE IS NO RESIDUE, OR ANY SIGN THAT IT WAS THERE AT ALL. THEY ARE ABLE TO PASS THROUGH THE FATTY LAYER UNDER YOUR SKIN KNOWN AS THE LIPID BILAYER, WHICH IS WHAT PULLS THE FAT SOLUBLE ESSENTIAL OIL INTO YOUR BLOODSTREAM. 03. ESSENTIAL OILS CROSS THE BLOOD-BRAIN BARRIER. THE BLOOD-BRAIN BARRIER IS A BARRIER/COATING, AROUND THE NERVOUS SYSTEM AND AROUND THE BRAIN, TO KEEP TOXINS AND JUNK OUT OF IT. THE CELL PARTICLES OF EOS CAN CROSS RIGHT THROUGH THIS, AND DRIVE THEMSELVES RIGHT INTO YOUR BODY QUICKER AND MORE COMPLETELY. 04. ESSENTIAL OILS WORK OFF OF FREQUENCIES. YOUNG LIVING KNOWS THE VIBRATIONAL FREQUENCY OF EACH PLANT/OIL. THEY ALSO KNOW HOW THE BODY’S CELLS FUNCTION OFF OF DIFFERENT FREQUENCIES. THEY MATCH THE PLANTS THAT HELP TO STIMULATE AND SUPPORT THAT PART OF THE BODY TO CREATE SPECIFIC CHANGES. THEY USE OILS AND CREATE BLENDS TO HELP YOUR BODY TO OPERATE EXACTLY AS IT IS SUPPOSED TO! 05. ESSENTIAL OILS ARE ADAPTOGENIC. ADAPTOGENIC MEANS THAT ESSENTIAL OILS CAN CHANGE AND ADAPT TO WHAT THE BODY NEEDS, BECAUSE IT’S A NATURAL SUBSTANCE. IT DOES FOR MY BODY WHAT MY BODY NEEDS, AND FOR YOUR BODY WHAT YOUR BODY NEEDS. THE EO YOU ARE USING IS NOT GOING TO GO PAST WHAT THE BODY NEEDS, YOUR BODY WILL JUST STOP ACCEPTING IT! 07. ESSENTIAL OILS CLEAN RECEPTOR SITES. OILS ARE MADE UP OF SOME CHEMICAL CONSTITUENTS CALLED PHENOLS, MONOTERPENES AND SESQUITERPENES. YOU KNOW WHAT THEY DO? THEY CLEAN THE RECEPTOR SITES ON OUR CELLS! WHEN YOU’RE DEALING WITH DAILY STRESSORS, JUNK, TOXINS, BAD EMOTIONAL STRESS… ANYTHING THAT STRESSES YOUR BODY, YOUR RECEPTOR SITES GET DAMAGED! OILS HELP CLEAN THEM! 08. ESSENTIAL OILS ARE SAFE. AND EASY TO USE! IT’S EASY, babes! we PROMISE. AS YOU FIRST START TO USE OILS, START SLOWLY JUST LIKE YOU WOULD WITH ANYTHING! FOR YOUR KIDDOS, GRAB SOME COCONUT OIL TO DILUTE, OR USE FEWER DROPS IN THE DIFFUSER TO GET STARTED. BUT YOUNG LIVING OILS ARE SAFE AND AWESOME! USE THEM! + A BONUS OIL – STRESS AWAY (for stress, sleep & perfume) as well as, a sample of NingXia Red + Thieves household cleaner. + the option of joining our private wellness group on facebook, which is where you can learn everything you need to know about using your oils & connect with an amazing, inspiring community. + IF YOU ARE INTERESTED IN the business side & SHARING ABOUT THE COMPANY we are so PASSIONATE ABOUT HELPING WOMEN EARN INCOME TO HELP SUPPORT THEIR FAMILIES! WE HAVE MONTHLY BUSINESS dream calls & PROVIDE MENTORSHIP TO EVERYONE WHO JOINS OUR TRIBE! + your young living lifestyle membership & 24% off every product available.